Sharing a post on Honey. How to create a new post, add content, and share with your team. Sharing a post on Honey is simple. 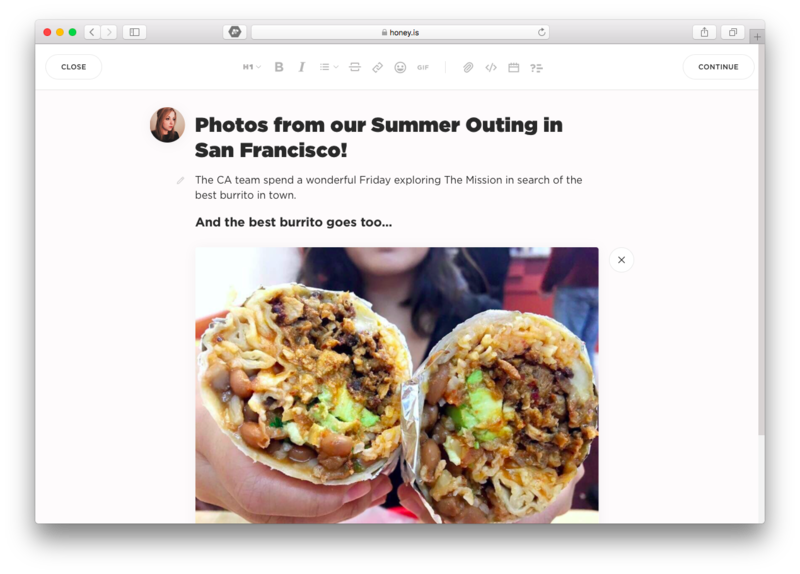 Whether you're sharing a quick text update, an important file, or a long-form newsletter, our post form makes it easy to add content and format. Here's how. From any feed page, click the orange new post button in the bottom, righthand corner of your screen. A blank composition form will open. Add your content. Type in your title, text, and add any additional rich content that you'd like, including files, photos, videos, gifs, emojis, and more. You can learn all about the types of content you can add in the sections below. Click into the post body area. Paste the URL that you'd like to share. If your URL is on a line of it's own, your URL will likely embed a nicely formatted URL card. However, if it does not automatically embed, click your link to open the link formatting options and then click Embed. Click the paperclip button in the editing toolbar. Select the type of attachment from the dropdown menu. You can select attachments from your computer, Box, Dropbox, Google Drive and OneDrive. Follow the directions from the selected attachment to locate your file. Once the file is selected, it will beautifully embed in your Honey post. Using Honey with G Suite. Embed an event widget or poll widget. Our interactive widgets make it fun and easy for employee to view and save events and participate in polls. Click the calendar or poll icon button in the editing toolbar. Fill in the information for the the event or poll. To add more than one poll in your post, click the poll icon at the top header. Please note you can only add one calendar event per post. Adding an event to a Honey post. Adding a poll to a Honey post. When you're happy with your post, let's get it published. Click the Continue button at the top, righthand corner of your post composition form. Select the group and topic to share your post. You can select more than one group and topic. Then, click the blue Share to... button. Your post will publish, will be visible to your colleagues, and send as an email notification to anyone who has selected to receive instant email notifications. Save your post as a draft. If you're not quite ready to publish your post yet, you're in luck. As you've been composing, your post has been auto-saving as a draft. If you you are ready to save your post as a draft, simply click the close button at the top, lefthand corner of the page. The post will then save as a draft. To locate the drafts, click the home button located on in your lefthand navigation bar. Then, click Posts at the top of the page. Then select Drafts from the menu. Click into your saved drafts to continue editing and publish when you're ready.